Folks, like I've been telling you, we're in that most sacred of times. A legion of angels reaches out for us. Can you feel their divine presence? And if you do, there's nothing to fear. Heck no! If the angels come a-knocking, you just let 'em on in and fill yourself up with their Grace. This is the Reverend Buddy Boyle in the Goin' for Glory Hour wishing you a most blessed day. Amen. Reverend Buddy Boyle was a televangelist that the angel Bartholomew had been using to get his followers to consent to becoming vessels for angels. After finishing filming a sermon in his office, Buddy is congratulated by Bartholomew, who tells him how God is pleased with his work helping the angels find new vessels. When a secretary enters the office, and tells Buddy and Bartholomew she is ready to "Become a vessel for the divine," Buddy is ecstatic... until the secretary blows up. Confused as to what happened, Bartholomew tells him that "not all who are willing are designed to contain Heaven's grace." Dean discovers that a man who disappeared and was believed to have been killed by the angel Ephraim actually became his vessel after becoming one of Boyle's followers. When Vesta kidnaps virgins and they disappear in a strange blue light, Sam and Dean wonder if they became the vessels of angels due to a situation similar to Boyle's influence, but decide that its not that. 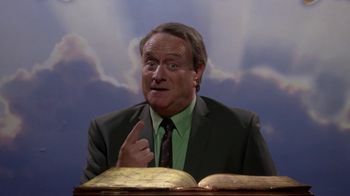 According to Sam, Buddy Boyle has gone off the air and has stopped recruiting for Bartholomew, preferring to recruit at prayer meetings, as means for Bartholomew to control which angels get a vessel, and assure their loyalty to him. Bartholomew reveals that he has decided to do away with Boyle and his other human followers and has turned them into vessels for his angelic followers himself. He has also taken over Boyle's company, Boyle Ministries and is using its resources to build his power base and track Metatron.